The building was re-roofed and portions of the building were gutted and floors lowered after Electrical Engineering moved out. 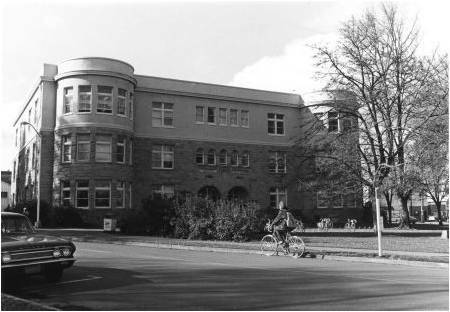 Labs for structural engineering, soils and sanitary engineering were constructed at a cost of $20,942. Room 212 was remodeled (raised sections of floor removed, lecture table removed, and radiators were lowered) The darkroom in Apperson was enlarged and remodeled, and fluorescent lights were installed in Room 215. If you were to have walked into the building in 1961, you would have seen windows in the central stairway for ventilation. There was also an opening between the second and third floors so the light from the skylights would light up the second floor hallway. All the doors were originals, with frosted glass and transoms. Then the Fire Marshall inspected the building, and his report concluded that either some changes needed to be made or the building would have to be vacated! • Floor over light well (between second and third floors) • Enclose stairwells with one-hour doors. • Install house fire alarm. • Install additional exit door to swing out at main entrance. • Replace dead-man latching device on north exit door with panic type hardware capable of being readily opened from the inside. • Make walls, ceilings, one-hour. Use 5/8”gypsum board, • 1 ¾” thick solid core doors. • Eliminate transoms and windows in stairwell.